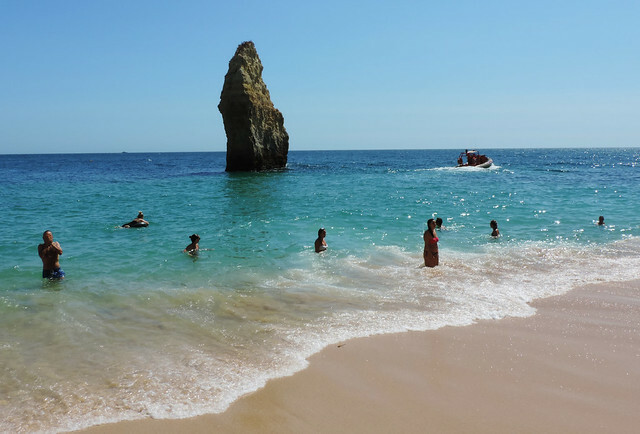 We’ve visited Portugal for the first time in our lives this September and we’ve spent most of our time in Algarve. 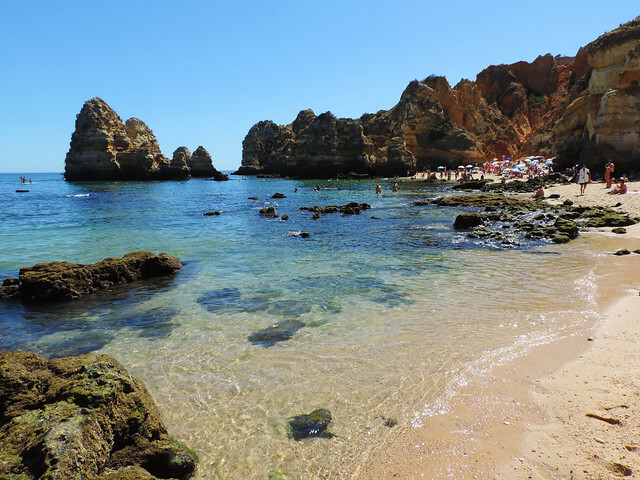 It’s the southernmost region of Portugal and it has breathtakingly beautiful beaches! Golden sand, crystal clear, emerald green bays, orange, yellow and red limestone formations, caves and arches along the coastline make these beaches unique in the world. Who would have thought that emerald green goes so perfectly with vivid yellow and red? All the colors along the coastline were feast for our eyes. 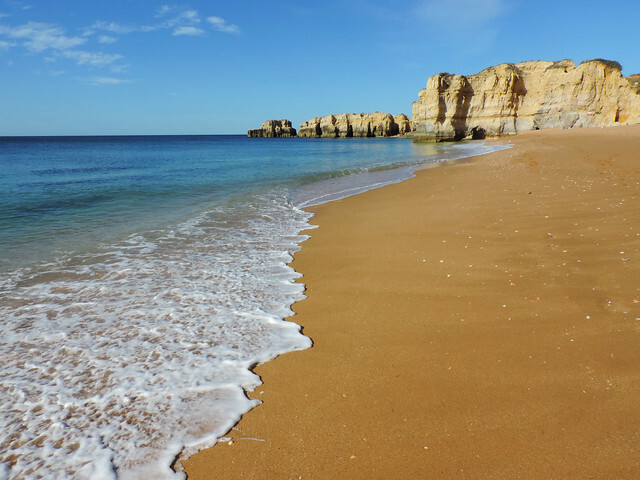 Unlike the beaches of Portugal’s Western coastline, the beaches of Algarve are all very protected – therefore suitable for swimming just as much as for amazing coastal hikes or romantic walks in the soft sand. The water temperature is not particularly warm, but hey, this is the majestic and restless Atlantic Ocean. Our favorite beach? We have quite some! 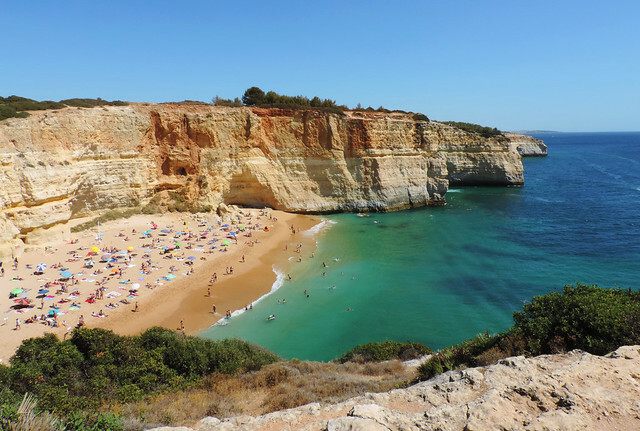 Marinha is advertised as one of the most beautiful beaches in the world and we have to admit it really deserves the hype. Magical colors, tick. Soft sand, tick. Wonderful rock formations, tick. Water cave, tick. Large waves, tick (not too large though, it’s still a perfect swimming beach). What else could we say? 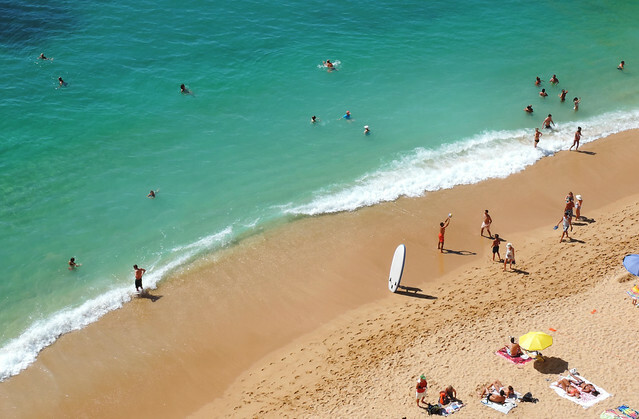 It’s probably the prettiest beach we’ve found in Algarve – and one of our favorite beaches in the world, as well. Carvalho is a small bay with deep and crystal clear water. 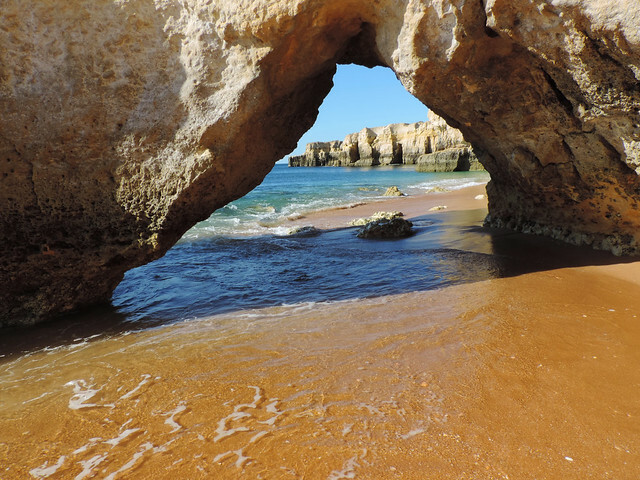 It’s in the shade of huge yellow and orange cliffs and there’s a short tunnel carved into the rock to allow access to the beach. Pictures are worth more than a thousand words. Benagil is also a lovely beach. 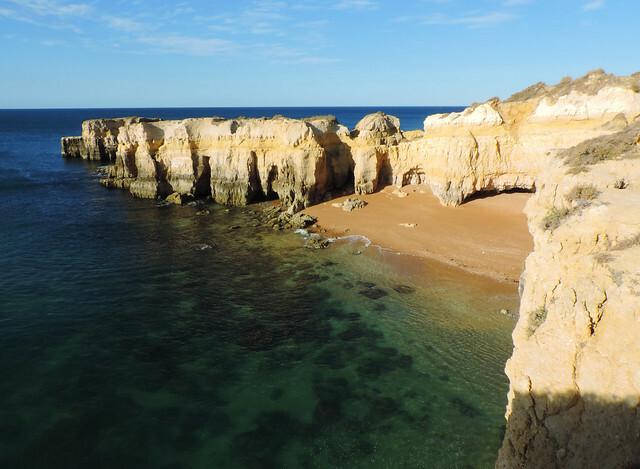 However, what we found very spectacular there is not the beach itself – but Benagil Caves. They are located in a bay right next to the beach. 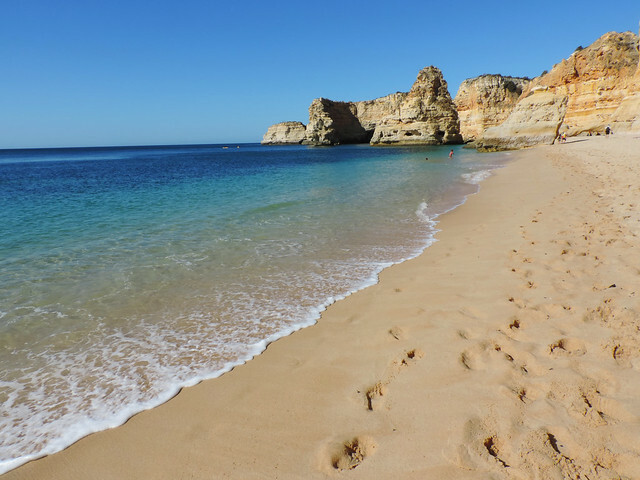 Boat trips start from Benagil Beach to the caves but actually, it’s so close that you can swim there if you are comfortable swimming in deep water. We did. And what a reward we got! Two caves connect at a beach hidden in an even larger cave that has a hole at the top (does that count as a cave then?). It’s one of those masterpieces that only nature can create. 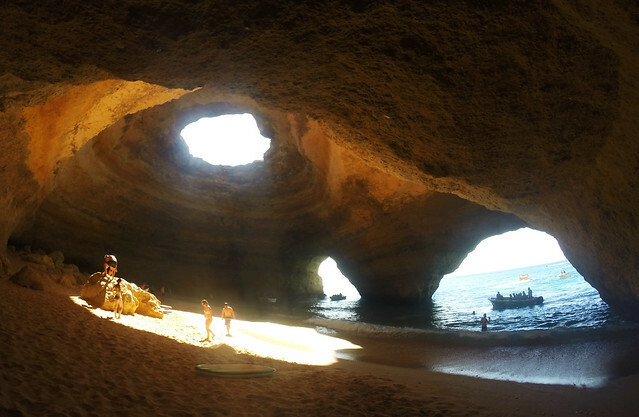 In our opinion, the best time to visit Benagil Caves is around noon because sunbeams reach the bottom then. It makes for a special view for one and it also warms you up. Have I mentioned that the ocean is kinda chilly? 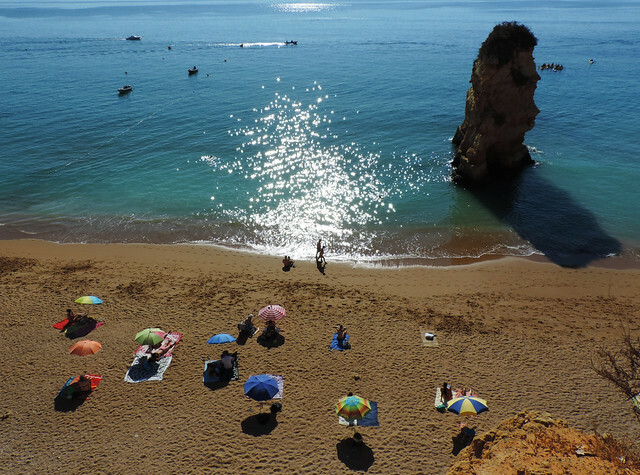 Dona Ana offers everything we expect from a dream beach: golden sand, all the shades of green and blue, photogenic arches and colorful rock formations. The water is shallow at the beginning so children (and adults! 😀 ) can play in it. But it’s not too shallow, it’s also suitable for swimming and snorkeling. 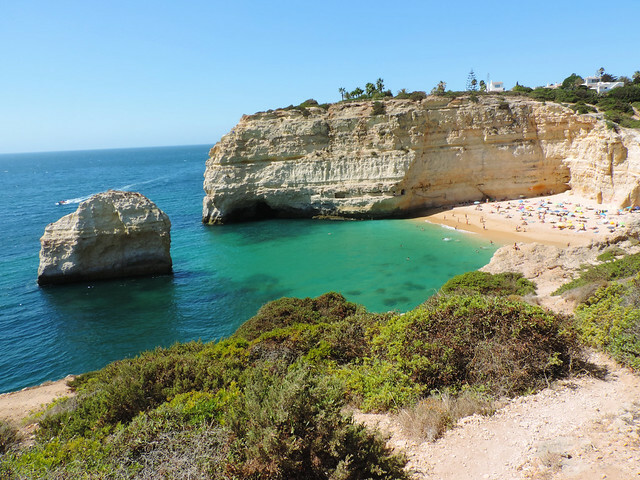 It’s in a protected bay near Lagos and it’s located along the short coastal trail starting from Farol da Ponta da Piedade. 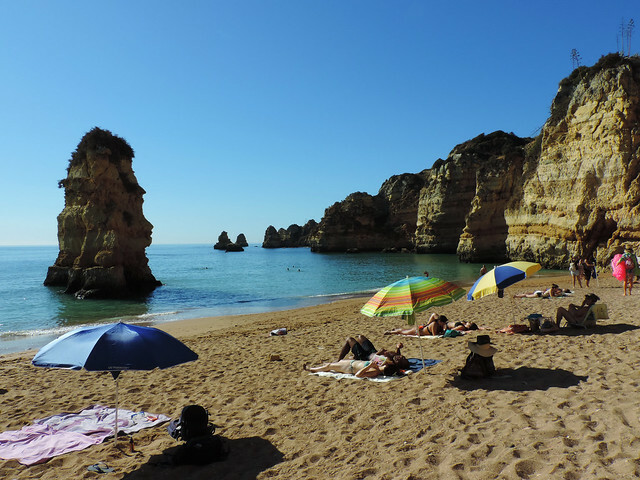 Camilo Beach is located in a smaller bay next to Dona Ana. It offers similar beauties but honestly, could you get enough of such wonderful beaches? We definitely couldn’t. The incredibly long sandy beach of Três Castelos also spoilt us with the amazing contrast between emerald green water and yellow cliffs. This is the ideal beach for long romantic walks! 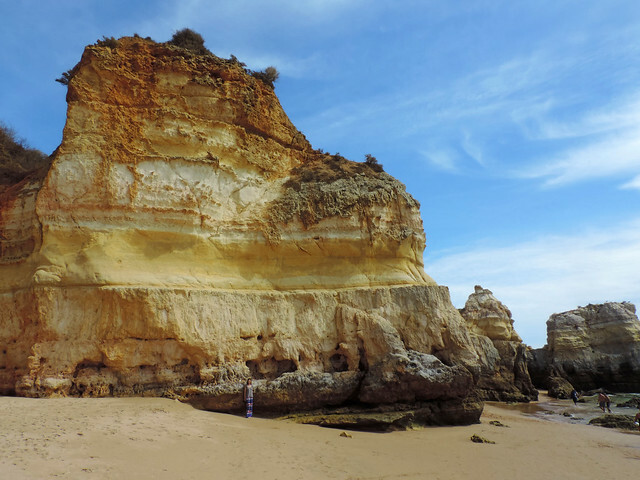 Plus, we could find exciting rock formations all along the beach. Probably Coelha Beach is the least known of all the beaches in this list. 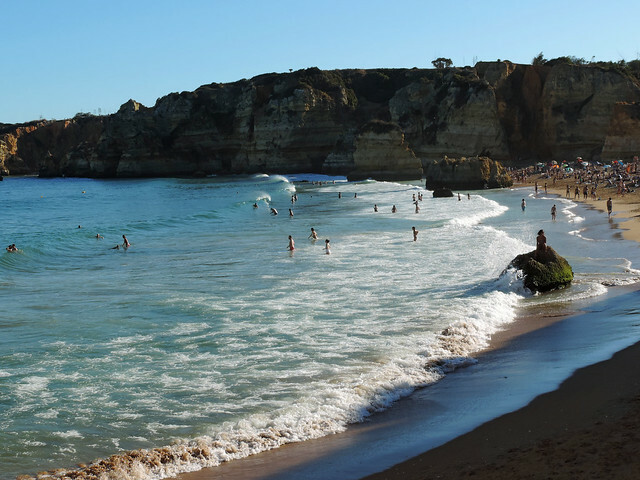 It’s located right next to Praia Do Castelo, a beach popular mostly among locals. Actually, we planned to go there initially. 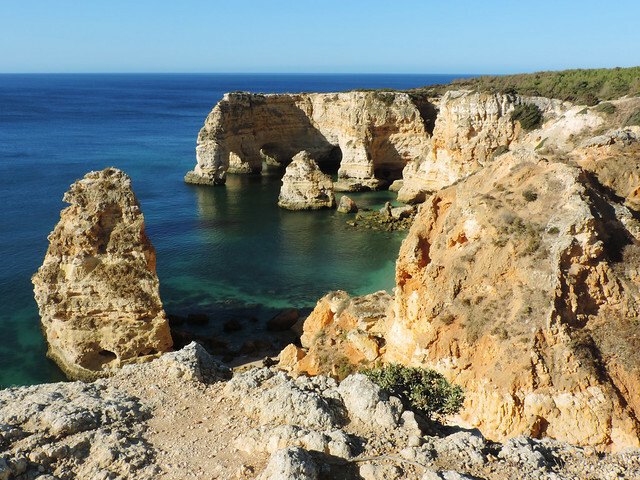 But we started our day on the rocks above Praia Do Castelo and discovered Praia da Coelha during our walk. We couldn’t resist. We were the only ones on the beach in the morning. Incredible amount of shells were washed out to the shore. Then we saw a pretty arch in the water. And all the rock formations surrounding the beach. We stayed for the day. It was our last day in Portugal and we couldn’t have asked for a more perfect goodbye. 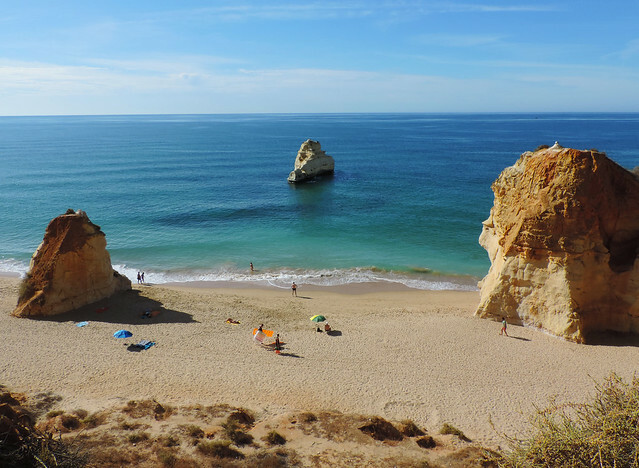 Have you ever been to Algarve? What is your favorite beach? 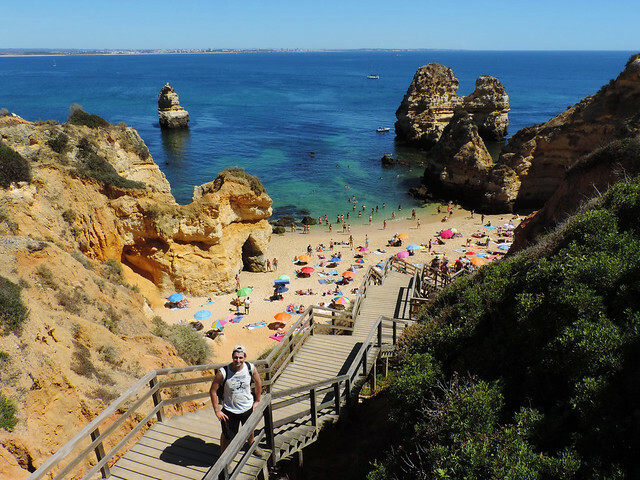 Algar Seco, Portugal – Welcome To Cheeseland!